Ankle sprains are a remarkably common injury, but that doesn’t mean that they shouldn’t be taken seriously. Spraining your ankle can result in pain, bruising, swelling, and in some cases, an inability to walk on the ankle until it is fully healed. What’s more, failure to care for your injury properly can- and often does- result in lasting negative side effects. An ankle sprain can result from nearly any action that causes you to put pressure on your ankle while it is twisted in an unnatural position. Ankle injuries can be caused by sports in which you must change direction quickly, such as soccer or lacrosse, or they can be caused by an everyday action, such as exiting a car or descending stairs, in which you placed your foot in an awkward position. Rest your injured ankle to avoid putting more stress on the inflamed area. Wrap the ankle, or wear a brace. 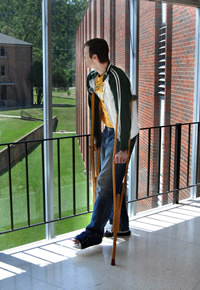 For more serious sprains, walk using crutches to avoid putting any weight at all on your ankle. If you experience any pain when you try to use your ankle, it’s too soon, and you need to resume resting it immediately. Icing your ankle reduces both swelling and pain, sometimes better than painkillers. The best way to ice an injured ankle is to wrap a bag of ice in a towel and apply it for 30 minutes. Then remove it for at least 30 minutes to let your skin return to normal temperature. Repeat this 30 on, 30 off pattern for as long as you choose. Wrapping your ankle with an elastic bandage not only helps to provide support, but it also reduces inflammation and pain. Just make sure you don’t wrap it too tightly, as this can restrict blood flow to the area. It is best to keep the injured ankle elevated to allow the body to reabsorb any fluid that may have leaked during the sprain. If possible, sit in a reclining chair or prop the leg up with pillows to keep the ankle above the heart. What you probably didn’t know about ankle injuries is that in some ways they never fully heal. Once the ligaments surrounding the ankle are stretched out, as they are during the violent force of a sprain, they never return to their normal shape, and they also lose some of their ability to communicate with the brain. These two factors together result in decreased ankle coordination and strength. Less ankle coordination and strength results in less ankle stability, meaning you will always be more susceptible to future ankle sprains. Fortunately, there are steps you can take to combat this unfortunate fact. One simple thing you can do to help tighten up the ligaments and regain some coordination is to balance on your bad ankle (but only once the injury has fully healed). You can also perform ankle stretches to help regain any lost range of motion and to combat the stiffness that ankle injuries commonly cause. Physical therapists like Daniel Baumstark of PhysioDC can help you get on the path to ankle recovery, and they can also help with other injuries. PhysioDC, a boutique physical therapy office, is located at 1001 Connecticut Avenue NW, Suite 330 in Washington, D.C., and they accept most regional insurance plans. Contact them today at 202-223-8500 or online at PhysioDC.com. Note: This article was written for PhysioDC, a physical therapy office located in downtown Washington, D.C.